If you need awoof airtime and data, then download Eagleee News app on your phone, read news daily and get free coins in return which can be converted into airtime, data or even real money to buy phones like iPhone X and pay for Dubai trips. Interesting right? Eagleee News app has a similar design and interface as Opera News app but it's a better alternative to Opera News because you get rewarded for reading news everyday. Those of us on NNU and Wakanda.ng will understand this part as it's similar. So the free coins earned can be used for data subscription, turned into real cash or used in purchasing different kinds of stuffs online. WHAT IS EAGLEEE NEWS APP? Eagleee News is born to discover one diversified world around you which brings the latest viral content to keep you up to date from Nigeria, South Africa, Kenya, Ghana, Zimbabwe, Mozambique, Egypt and international. Download to get the most updated news, fun gifs and videos covering sports, politics, lifestyle, quizzes and entertainment for all your passions in one place. Every one of our readers is of great value to them. Every day they elaborately pick trendy news for you. They also customize your favourites according to your choices. Latest football matches, NBA, WWE… they provide the latest sports news and match predictions. Make your vote! Not enough data left for the month? Wanna read news on your way home? They have got you covered! Offline reading allows you to read the most updated and viral content without data consumption. Try it now! Rejoice book lovers, they have picked over 60 viral novels for you! Science fiction, romance, mystery fiction, thriller… take your pick! Get started reading now! WHERE CAN I DOWNLOAD EAGLEEE APP? ✔️ Click here to download Eagleee News App for Android devices. 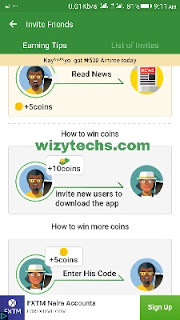 Eaglee News gives you +5 coins for each news you read on the app, +10 coins when you invite or refer someone to download the app and you are also entitled to another +5 coins when the person you invite/ refer enter your referral code to the app to confirm you as his or her referee. You can get instant free +5 coins by entering H7OVEB as your friend’s invitation code after downloading the app. 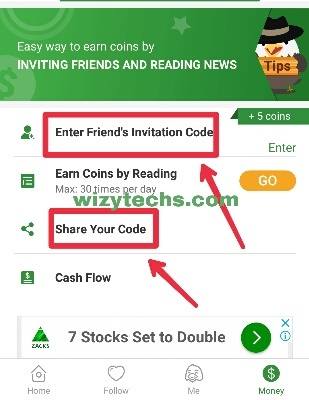 ✔️ Get your own referral link to invite friends on whatsapp, Facebook, Telegram, Twitter etc to download so that you are even more FREE COINS. ✔️ Try to read news on the app to get more coins on daily basis even if you don't refer people. The app has been downloaded over 1million times already. So why not join the people enjoying from it. How many coins does someone need for data or airtime purchase? And how many coin does someone get for reading a particular news? You need 1500 coins to get N500 worth of Airtime or data. You get 5 coins for each post you read.